This is a correction to a post I did a while back….The book I meant to recommend is by Rick Beech, called “The Origami Handbook – the classic art of paperfolding in step-by-step contemporary projects.” It is a favorite because it not only includes lots of fun models (among my favorites: a Pecking Crow “action toy”, compartment insert for the masu box, and a lovely page marker), but also lots of photographs and clear instructions. This is a real gem, available on Amazon with many good condition used versions offered at very low prices. Check it out by clicking the link below, and enjoy! I know, this is long overdue and late for Valentine planning — my apologies! But if you’re a last-minute type like I am you may enjoy this cute, clever and relatively easy stand-up heart. There are a couple of slightly tricky steps but I’ve tried to make my instructions and diagrams easy to understand…. All you need is a square sheet of paper; easiest to follow the directions if it is printed on one side and white on the other. A 6″ square works great, I haven’t tried bigger … I like 4″ as well but if you go too much smaller the folds get kind of thick toward the end. Start with your square sheet of paper white (or un-printed, or that you don’t want to show when we’re finished) side up. Fold the sheet in half from the top to the bottom and give it a good crease; be sure that the open (not folded) edge is on the bottom, nearest you. Diagram 1 below shows the folded sheet with bottom edges down, and indicates our next move: the dashed lines indicate where we fold next — bring each bottom corner up to the center of the top edge, fold and crease well. The result should look like Diagram 2 below. As shown in Diagram 3, take each of the upper corners, fold them down to the bottom point and crease. Your result should look like the diamond in Diagram 4. As indicated in Diagram 4, next take each of the top layers of the bottom points and fold them up to meet the top point. Crease each one well, as shown in Diagram 5. Now we are going to focus on the right side first: the result of the next step is shown in Diagram 6. Take a deep breath, it’s not difficult if you pay attention to detail. Note that I have labeled some points on the diagram, and that valley folds are marked by dashed lines and the mountain folds are marked by dashed & dotted lines. It is important as a first step here that you reverse the folds that run from the center to point B and from the center to point A (that is, change the valley fold to a mountain fold and the mountain fold to a valley fold). Then swivel point B over to meet point F; as you do so the bottom half of the opened side will come up and you can lay point D down on top of B (which is now on top of F). Flatten everything out and crease all over. The result should look like Diagram 7 below. Now do the exact same thing on the left side of the model, resulting in Diagram 8. 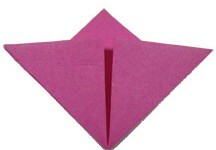 Note that there are two “flaps”, one in each of the upper left and right corners. First take hold of the upper left flap. Gently lift and bring it straight down so that what was the top edge now lies along the center vertical crease, ending at the bottom point. Do the same on the right side. See Figure 9 for what the model will look like after this step. Finally, flip the model over from top to bottom; Be sure your result looks like Figure 10. Note the diamond shape in Diagram 10. Fold the top point of the diamond down to the bottom point and crease — see Figure 11 for the result. You can now see in Figure 11 that there are two separate squares at the top. 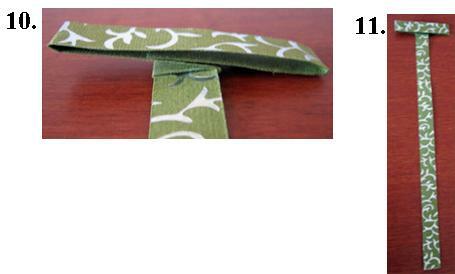 Fold the top edge of each square down to meet the middle horizontal crease, and crease well; see Figure 12. Unfold each of these folds; we will use the creases we just made as landmarks for our next folds, shown in Figure 13. Now focus on Figure 13. 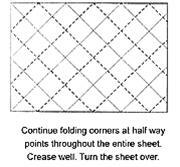 Fold the left and right top corners of each square down to the center of the crease we just created as a landmark; crease and keep folded. Then fold the top points down to that landmark crease as well, and crease, as shown in Figure 14. Voila, see Figure 15 — this is the back side of your heart! Fold the top layer only of the bottom point up a bit and crease; turn the model over to see the prettier side, and use the folded point behind to make it stand up. Play with the location of the fold and see how far up or back you want your heart to tilt. 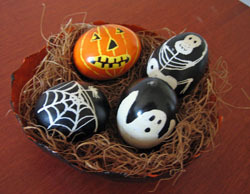 Put one on a card, make a bunch of them to put around a dining table, sneak one onto someone’s pillow … Enjoy! Our last two steps: first, fold the bottom point up to meet the top of the edges you just finished folding. Then turn the whole thing over (see photo). For our last two flower steps, we are going to take the left and right points and fold them up toward the top point, but not all the way. Bring them up just a bit off center — look at the photos below to guide you. There is no precise point to fold to here — it’s a matter of taste and what appeals to you. When you have folded up both points, your flower is done. For the final step, place the bottom point of the flower into the middle point of the plant holder or vase, as shown below. Take a cruise, learn a craft — or teach one! Did you know that you can “earn” cruises by speaking or teaching on board? I do so regularly and have had some wonderful adventures as a result. Learn how you can earn free cruises here! Are these not adorable? 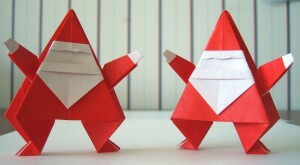 This origami Santa was designed by Linda Mihara. I took her class at the 2009 Pacific Coast Origami Conference and thoroughly enjoyed it. However, it was an afternoon class and my brain was over-full from the day’s instructions. I didn’t get the figure quite right and later could not remember how to make it. 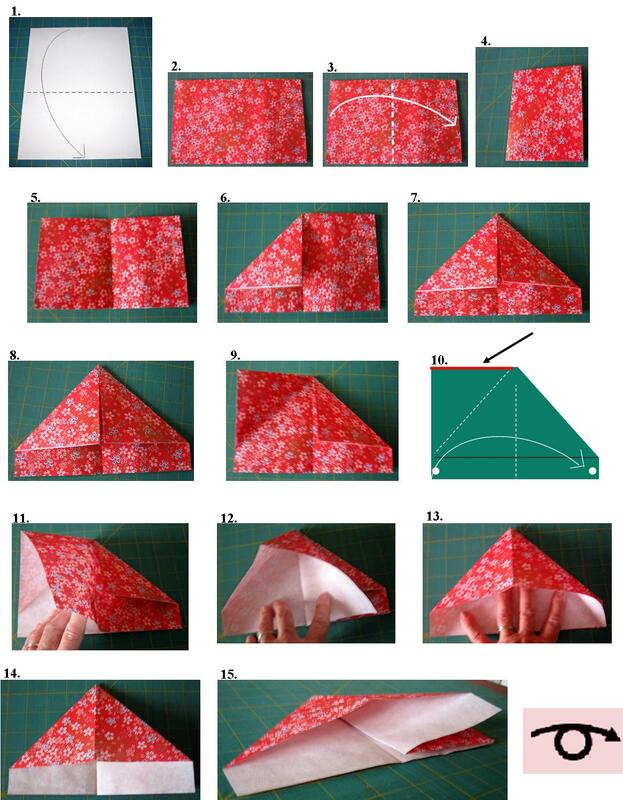 Fortunately it is included in John Montroll’s book: Easy Christmas Origami. I purchased the book and worked through the instructions…with more than a little help from my friends. Some people may find Montroll’s diagrams and very limited instructions to be all that is needed, but I’m afraid I need more! I now have this guy pretty well figured out and can turn one out in a reasonably short period of time…fortunately, because I plan to use them on Christmas cards this year. I have come up with my own guidelines, landmarks and techniques for completing the figure so that it comes out right and usually will even stand up on its own. If you’re up for some fun Christmas origami you might want to purchase John Montroll’s book. It is a bargain on Amazon and is also eligible for Prime shipping. In the meantime, I am going to see if I can contact Ms. Mahara and see if she will give me permission to post my own instructions with photos. Please post a comment if you would find that helpful and it will help our case! 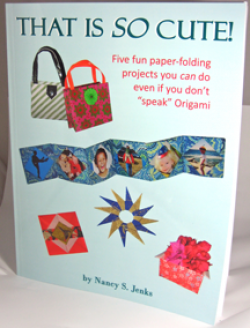 If you’re interested in some fun, cute and practical Origami crafts for year-round decorating and gift-giving, take a look at my book. It is designed for origami enthusiasts AND beginners, with clear step-by-step instructions with photos — you do not need to understand traditional Origami diagrams to make these models! 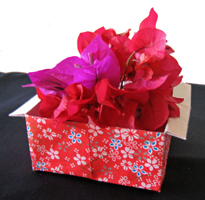 Just choose appropriate colors and thems for your papers and customize these items for the holidays. 1. I like to start with George Washington face up. Use as crisp a bill as you can find, as that will make it easier to fold and make nice sharp creases. Position the bill as shown below (A. 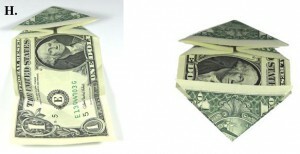 ), and then fold each of the bottom corners up to meet the top edge of the bill (B.). Crease well and unfold. The resulting creases should look like (B2.). 2. 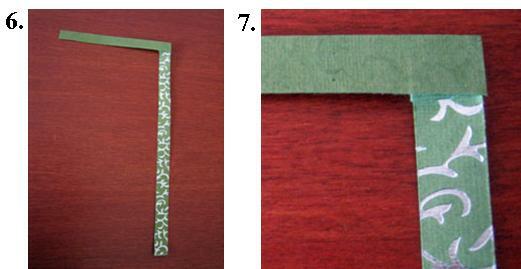 Next, do the same with the top two corners, folding them down to meet the bottom edge of the bill, as in (C.). Crease folds well and unfold. See resulting creases shown in (C1) & (C2). All these folds are called “valley folds”, as the “peak” is at the bottom (like a valley). 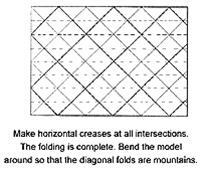 The reverse of this fold, which we’ll see in the next step, is called a “mountain fold”…. 3. Now we want to fold each side of the bill back in a mountain fold, at the precise point where the “X” creases on either side of the bill intersect. We will make two folds, with the result shown in (D.); the creases are shown in (D1); ignore the red circles until the next step. Note that the blue crease lines are a combination of dashes and dots, representing a mountain fold. The “X” creases are valley folds. Be sure to crease all folds very well. 4. Note in figure (D.) that the mountain fold creases point up. With your index finger, poke down just the point at the intersection of your creases on each side of the bill, marked with the red circles in (D1.). The result should look like (E.) and the close-up in (F.) below. Turn your bill a quarter turn to the left as in (F.) and, with an index finger on each side, start to bring the points indicated with the green arrows in (F.) in toward each other, as shown in (G.). Continue to bring them together; as you do, the upper portion of the bill will fold down over them — this should happen quite naturally due to the creases you have made. The result should look like (H.). Repeat this fold on the opposite end of the bill; the result is shown in (I.). 5. Turn your model so George is once again right side up (J.). Next fold the entire unit in half, from right to left, as in (K.). Note the yellow crease lines shown in (K.); fold the upper and lower right-side corners along those lines, so your model looks like (L.). 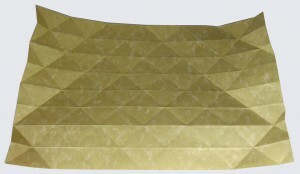 Using the inner edge of those folds as a guide (indicated by the yellow crease line in L.), fold the top layer of the left-hand point over to the right. The result is shown in figure (M.). 6. Note that the upper layer of the top and bottom points of the model each have a “flap” on the right and left sides (see N.). Following the indications of the arrows and crease lines shown in (O. 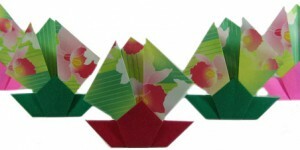 ), fold the tips of the flaps on each side out to meet the left or right points of the model. Figure (P.) shows the upper right flap folded out to the right point; crease well. The lower right flap is folded to that same point in figure (Q. ), and the left side folds are shown complete in figure (R.). 7. Now we start to have some fun! Take the upper right flap you folded in the previous section, and gently press on the tip to open it up a bit — see the result in figure (S.). Continue to press (as in T. ), bringing the top point down to the center of the model and forming a small square shape. Crease the folds well; the result is shown in (U.). Do the same with each of the remaining three flaps; the end result should look like (V.). 8. Figure (W.) is the same as (V.). 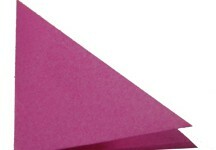 with the addition of yellow crease lines on the upper right square folded in the previous step. 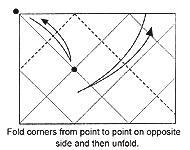 Fold the two corner points in to meet in the middle, along the crease lines indicated—the first fold is shown in (X.) and the second in (Y.). Crease well. Do the same on the three other squares; the result should look like (Z.). 9. 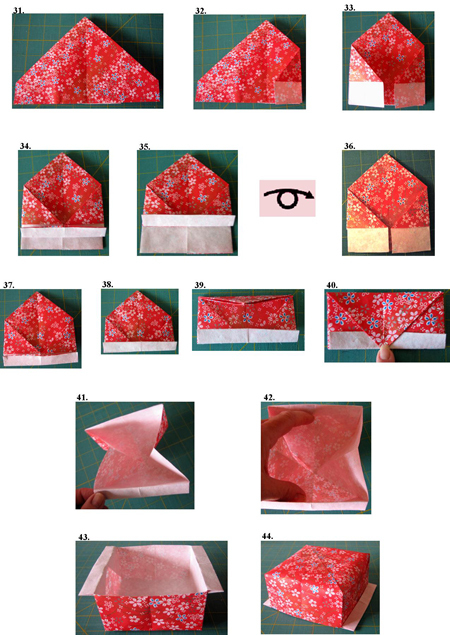 Next we do some folds similar to the “squash” folds you did to create the squares in step 7. You are going to open up each of the flaps you just folded in step 8 and squash the top down flat to create a kite-like shape. These flaps are quite small, so it will be useful to use a toothpick to open them up — see figure (AA.). See the completed fold in figure (BB.). Now do the same fold with the remaining seven flaps… The result should look like figure (CC. ).Now fold the back of the model back to meet the bottom point and crease. You will be able to see your heart taking shape (figure DD.). You’re almost there! 10. 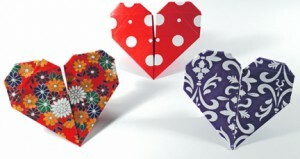 Finally, fold the right and left points back, and there is your heart (EE.)! Figure( FF.) shows the heart from the back. Use the heart as is, as a gift or tip. 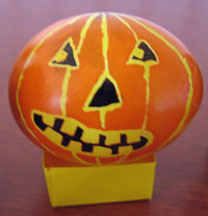 Or put it on the front of a card — use a tiny piece of double sided tape to do that, or better yet a removable glue dot. They are nice to leave as a tip, and you can use the folded piece in the back to “hang” it on the portfolio your restaurant check arrives in, or on a glass, or wherever appeals to you. You can also tuck a quarter snugly in to the front of the heart, held in place by some of model’s points. Some people call this a “change of heart”….. This is a simple model created from a single, long and narrow strip of paper. Quilling paper works well if y ou happen to have that on hand — it’s often available at craft stores like Michael’s as well as online. But you can use any kind of paper that is available in large enough sheets to let you cut a strip that is 13-15″ long and 1/2 to 5/8″ wide. I like to use paper that is a different color on each side even though only a small square of the “wrong” side shows up in the final model. 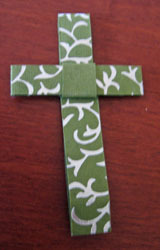 I hunted down instructions in order to make these for my classmates at the close of a recent Bible class at our church. It was enjoyable to make them on All Saints Day/All Souls Day as I remembered the dear people no longer with us who have been so important in my life. That’s one of the beauties of Origami … once you have mastered a particular techniqe or model, it is a lovely, meditative and relaxing activity. I used a piece of paper about 15″ long and just over 1/2″ wide. It has a vine pattern on one side and is green on the other — decorative paper that I bought at Paper Source (one of my favorite stores). We used this paper in several items for my son and daughter-in-law’s wedding this past summer — fortunately I’m a compulsive saver and kept the long narrow strips left from cutting many smaller pieces from large sheets of this paper…yay!. 6. Still holding the unit, fold the arm back across the front of the piece and crease it even with the right side of the stem, as in photo 6 and close-up in photo 7. 8. Now lift what has become the left arm and start to fold it to the right — however, don’t fold it all the way across. 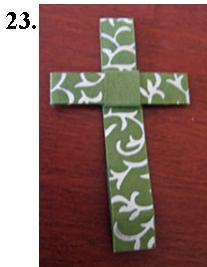 Stop so that a short piece still extends to the left — this will be the left arm of your cross. You may want to wait to crease it until you start the next step and can make the two sides even before committing your creases (though photo 9 shows the first crease already made – I used a fairly soft kind of paper so it was rather forgiving…). 10. Fold the right side under and slide it between the layers in the center as you can see in photo 10. Crease when you are satisfied that the left and right arms of the cross are approximately even. The result should look like photo 11. 14. At this stage, you may want to use scissors to create a point at the bottom of the vertical piece (as in photo 14) to make the next few steps a little easier. )Origami purists would not approve.) If you have not folded too tightly in steps 4 throught 6 this is not be necessary. 15. Lift the bottom of the stem and weave it up through loop at the center of the arms. 16. Draw it all the way through and 17. Crease. The unit should now look like photo 17. 18. Next we form the vertical part of the cross. Take the top point and fold it over and down, weaving it back through the loop at the center of the arms. 19. Draw it down until you reach the point that leaves the upper portion (above the cross arms) just a bit longer than the width of each arm. The result should look like photo 19. 20. Finally, fold the bottom stem under and back up toward the center. 21. Tuck it in between the layers in the center and 22. Crease when it is the right length. (Depending on how long a piece you started with, you may want to trim a bit off this bottom piece). Check my previous post for a discussion of this project — this post provides the how-to. Don’t be put off by the length of the photo instructions — I have just tried to be very clear for beginners, as abbreviated or graphical instructions have often frustrated me. Begin with a rectangular piece of paper – the one used in the photo is 8.5″x11″ and that works very well, yielding a bowl or box that is about 4.25″ on a side. If you are using paper that has a design or different color on one side, start with that side facing down. (For the purpose of learning, if your paper is the same on both sides you might want to use a pencil to shade one side and make that the “right” side which begins facing down) — See figure 1. Remaining instructions are numbered below, corresponding with the photos. The “looped arrow” graphic you see at various points means to turn the whole unit over (horizontally). 1-2. 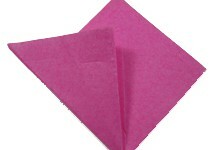 With the “right” side down and the paper facing you as in 1, fold the paper in half from top to bottom. End result is pictured in 2. 3. Now fold it in half horizontally, as indicated in (3); end result shown in 4. 5. Unfold the fold just made in 4. 6. Bring the upper left corner down to meet the center; crease the resulting fold as shown. Do the same on the right hand side, as pictured in 7. Resulting unit shown in 8. Unfold the left folded down corner so that it is once again in the upper left, shown in 9. 10. Take a deep breath and know that the next step is easier than it looks. The diagram in 10 is intended to show that you are going to lift the TOP LAYER ONLY of the lower left corner (note the white dot), and lift it up and over so that it lies on top of the lower right corner (see other white dot). As you do so, and as is shown in photos 11-13, “squash” the upper portion (the “right” side of the paper facing up) so that the top edge highlighted in red in diagram 10, with the black arrow pointing at it, will now lie down the center fold. Flatten the unit and crease your folds. The result should look like photos 14 & 15. When you get to this point, turn the whole unit over — we’re going to do one more step and then do the same thing on the other side! 16. After turning the unit over, lift the top portion of the left side and fold it over to the right (shown in 17)– you should see the folded-down corner now in the upper right, as in photos 17 & 18. 19. Now lift the upper right corner as we did on the left in 9. As shown in 20-22, follow the same procedure that we did in 11-14: lift the top layer of the lower right corner and bring it over to lie on top of the lower left corner, at the same time bringing the top point straight down and “squashing” it flat so that it lies along the center fold. Lay it flat and crease your folds. Result shown in 23. 24. Lift the top layer on the right and fold it to the left. (result shown in 25). Turn the whole unit over — result shown in 26. Likewise, on this side, lift what is now the upper layer on the right and fold it over to the left, as shown in 27; the result is shown in 28. 29. Next fold the upper layer of the lower right in to the center, and crease. 30. Do the same on the left side. 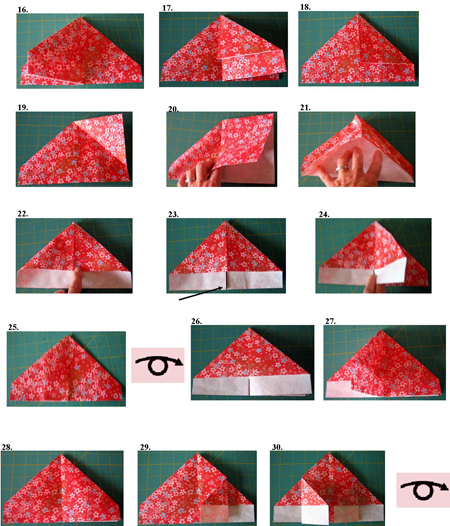 Fold and crease, and then turn the whole unit over; the result should look like photo 31 (see below). 32-33: Now repeat steps 29 & 30 on this side. 34. We’re almost there! Fold the top layer of the bottom portion (the white section in 34) up to meet the lower edge of the top section (the red print portion), and crease. 35. Fold that folded-over piece up again, this time coming up over the edge of the top section, and crease. Turn the unit over; it should now look like 36. 37-38: Repeat steps 34 & 35 on this side, and crease. 39. Next fold the top point down to the bottom of the unit; crease the top fold (40). 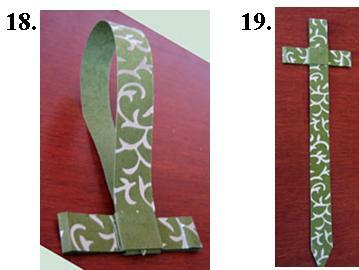 Finally, pick the unit up and hold it by the two “handles” — the segments you just folded over on each side. Gently pull them apart from each other — it should begin to look like photo 41. 42. Continue to separate each pair of sides, opening up the inner portion of the bowl as you do. 43. Smooth out your creases and voila, you have your bowl! 44. simply shows what the unit looks like upside down…. Enjoy — and post comments with your own clever ideas or questions!